In 1487, Sir Henry Bodrugan, pursued for treason, leapt from a Cornish clifftop into a waiting boat and fled to France. Bodrugan's Leap, as the clifftop has come to be known, lies close to John Wilkinson's childhood home, and supplies the title for the central cycle of poems in My Reef My Manifest Array. That totemic image of exile feeds an interest in borders and partings that runs throughout the collection. The Cornish landscape of the poet's childhood, loaded with new significance following the death of his sister, is Wilkinson's primary locus, but he ventures—flees, perhaps—farther afield, to Portland (Maine), Chicago, Sydney, and Busan. 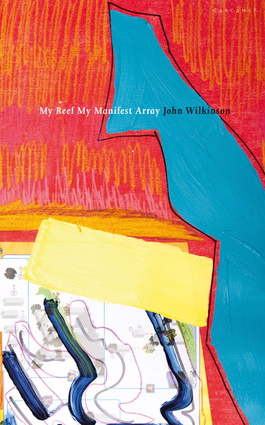 Combining extended sequences with brief lyrics, Wilkinson's lines tie minuscule linguistic knots that give pleasure when unwoven. The reading becomes archaeological as layers and layers of meaning, of feeling, of reason are exposed. John Wilkinson is currently a Professor in the Department of English and Director of Creative Writing at the University of Chicago.